Volunteers needed to join us at our upcoming volunteer day at MANNA. MANNA is a wonderful organization that provides meals for those with cancer, HIV/AIDS and other serious illnesses. 1. Applications: Please ensure each person completes the online application using this personalized link for your group: http://fsr.manna.volunteerhub.com/ prior to your arrival for your shift. Shift sign up will become available 2 months prior to your scheduled shift. 2. Minor Consent Form (under 18 ONLY): All volunteers must be at least 14 old. 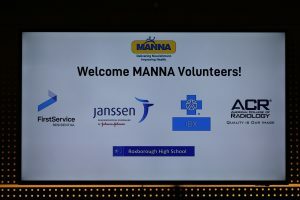 If anyone is a minor (under 18 years of age) a parental consent form must be filled out prior to being allowed to volunteer in the MANNA kitchen. The consent form is attached and can be printed out, signed and brought to MANNA on day of scheduled volunteer event. All minor volunteers MUST have a signed consent form or they will not be allowed to volunteer. 4. Cancellation Policy: MANNA relies on volunteers like you to ensure that our clients have the meals they need every week. Our kitchen counts on you when you sign up to work a volunteer shift, and group cancellations have a serious impact on the kitchen production. We suggest giving 8 days’ notice when you cannot keep your shift. 5. Sick Policy: If you are sick, please stay at home and get well. Do not come to MANNA to volunteer. We will look forward to seeing you when you are better! These regulations are for your safety and that of our clients—at MANNA, safety comes first! 6. Parking: There are several options for parking, but please note MANNA does not have any special parking rates or validations. a. Rodin Place Garage: This garage is attached to our building and charges $16 after 2 hours. b. Metered Street Parking: There is metered street parking available all around our building. Rates may vary. c. PPA surface lot: Located on Callowhill St. between 19th and 20th. Visit http://www.philapark.org/19th-callowhill/ for more info. d. Free street parking: There is LIMITED free 2hr street parking available on the surrounding streets. e. Bike racks: There is a bike rack located in the Rodin Place garage. FirstService Residential Missouri/Kansas will be accepting clothing, shoes, coats, and toy donations between now and April 25th. We will also be sorting the donations at the PAL Center Blue Valley Recreation Center 1801 White Avenue Kansas City, MO 64126 on Friday, April 26th if any FirstService associates are available to help. 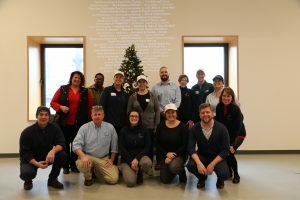 Dallas Animal Services (DAS) works with local, regional, and national welfare organizations to ensure the most vulnerable animals are placed in the best possible homes. DAS network includes a range of partners, from dog/cat rescues, small animal and livestock sanctuaries, and wildlife rehab centers. “Dallas90” is the most recent community outreach campaign launched by DAS to help care for the 35,000 animals they serve each year. “Dallas90” is designed to generate support in DAS’ effort to find positive outcomes for all healthy/behaviorally sound pets, which DAS believes exceeds 90% of the shelter population. FirstService Residential Dallas Office will host a Pet Supply Drive for DAS, collecting items like towels/blankets, treats, toys, kennels, leashes, and more. The Drive will kick off on April 11, National Pet Day, and will run until April 30, National Adopt a Shelter Pet Day, when the supplies will be delivered in person to DAS. It’s a fantastic way to help our furry friends! This great American tradition has been providing children in need with Christmas smiles for many years. Spread the real spirit of the holidays throughout your organization! We will make sure you’re all set up with Angel Tags that include a child’s gender, age range and toy suggestion to place in your lobby or office Christmas tree. Employees and customers take a tag, buy a gift and return to collection box that we provide.